XMLExtract reads data from XML files using SAX technology. It can also read data from compressed files, input port, and dictionary. XMLReader can use more complex XPath expressions than XMLExtract, e.g. it allows you to reference siblings. On the other hand, this XMLReader is slower and needs more memory than XMLExtract. XMLReader is based on DOM. For port reading, see Reading from Input Port. One field (byte, cbyte, string) for specifying an input of the component. Input fields can be mapped to output. For more information, see XMLExtract Mapping Definition. Any  (each port can have different metadata). Metadata on each output port does not need to be the same. Each metadata can use Autofilling Functions. Other output ports are required if the mapping requires it. If you connect an edge to the optional input port of the component, you must set the File URL attribute to port:$0.FieldName[:processingType]. XMLExtract does not propagate metadata. XMLExtract has no metadata template. If an input port is connected, its metadata has to contain a string, byte or cbyte field. Metadata on each output port does not need to be the same. Metadata on output port may contain lists. An attribute specifying what data source(s) will be read (XML file, input port, dictionary). See Supported File URL Formats for Readers. A mapping of the input XML structure to output ports. For more information, see XMLExtract Mapping Definition. The name of an external file, including its path which defines mapping of the input XML structure to output ports. For more information, see XMLExtract Mapping Definition. Allows using arbitrary namespace prefixes in Mapping. 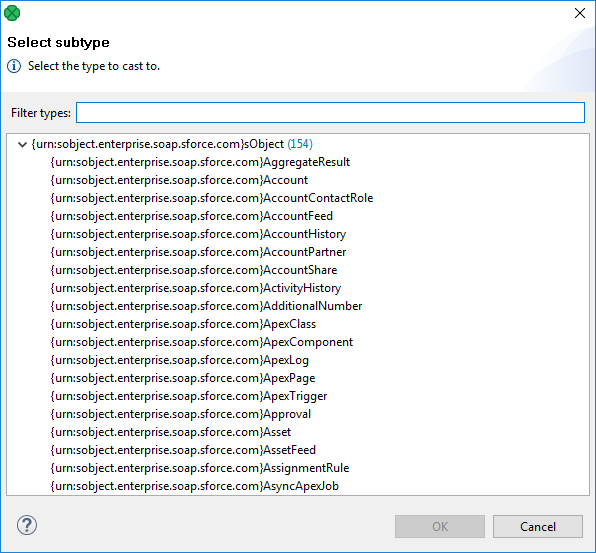 See Namespaces. A URL of the file that should be used for creating the Mapping definition. For more information, see XMLExtract Mapping Editor and XSD Schema. a sequence of individual expressions of one of the following form: nameM:=true or nameN:=false, where each nameM is an XML feature that should be validated. These expressions are separated from each other by semicolon. For more information, see XML Features. One of these must be specified. If both are specified, Mapping URL has a higher priority. In XMLExtract, you can map tags, attributes and input fields to the output. It can read multiple elements of the same name as a list. The mapping is specified in XMLExtract Mapping Editor. The mapping is defined in the Mapping URL or Mapping attribute. Every Mapping definition consists of a pair of the start and the end <Mappings> tags. The <Mappings> tag has no attributes. This pair of <Mappings> tags surrounds all of the nested <Mapping> and <TypeOverride> tags. The Type Override tag can be used to tell the mapping editor that an element on a given path should be treated as if its type was actually the overridingType. This tag has no impact on actual processing of XML file at runtime. Each Type Override tag must contain one elementPath attribute. The value of this element must be a path from the root of an input XML structure to a node. Each Type Override tag must contain one overridingType attribute. The value of this element must be a type in the referenced XML schema. In addition to nested <Mapping> elements, the Mapping can contain <FieldMapping> elements to map fields from input record to output record. For more information, see XMLExtract Field Mapping Tags. Field Mapping tags allows to map fields from an input record to an output record of parent Mapping element. Specifies a field from an input record, that should be mapped to an output record. Specifies a field to which a value from the input field should be stored. The nested structure of <Mapping> tags copies the nested structure of XML elements in input XML files. See example below. However, Mapping does not need to copy all of the XML structure, it can start at the specified level inside the XML file. In addition, if the default setting of the Use nested nodes attribute is used (true), it also allows the mapping of deeper nodes without needing to create a separate child <Mapping> tags for them). Remember that mapping of nested nodes is possible only if their names are unique within their parent and confusion is not possible. Each mapping tag must contain one element attribute. The value of this element must be a node of the input XML structure, eventually with a prefix (namespace). The number of the output port to which data is sent. If not defined, no data from this level of Mapping is sent out using such level of Mapping. If the <Mapping> tag does not contain any outPort attribute, it only serves to identify where the deeper XML nodes are located. The values from any level can also be sent out using a higher parent <Mapping> tag (when default setting of Use nested nodes is used and their identification is unique so that confusion is not possible). If true, the mapping will assign mapped values to the record generated by the nearest parent mapping element with outPort specified. Default value of this attribute is false. If false, the mapping will not automatically map XML fields to record fields with the same name. Default value of this attribute is true. The parentKey attribute serves to identify the parent for a child. Thus, parentKey is a sequence of metadata fields on the next parent level separated by a semicolon, colon or pipe. These fields are used in metadata on the port specified for such higher level element, they are filled with corresponding values and this attribute (parentKey) only says what fields should be copied from parent level to child level as the identification. For this reason, the number of these metadata fields and their data types must be the same in the generatedKey attribute or all values are concatenated to create a unique string value. In such a case, the key has only one field. The values of these parent Clover fields are copied into Clover fields specified in the generatedKey attribute. The generatedKey attribute is filled with values taken from the parent element. It specifies the parent of the child. Thus, generatedKey is a sequence of metadata fields on the specified child level separated by a semicolon, colon or pipe. These metadata fields are used on the port specified for this child element, they are filled with values taken from the parent level, in which they are sent to those metadata fields of the parentKey attribute specified in this child level. It only says what fields should be copied from the parent level to child level as the identification. For this reason, the number of these metadata fields and their data types must be the same in the parentKey attribute or all values are concatenated to create a unique string value. In such a case, the key has only one field. The values of these Clover fields are taken from Clover fields specified in the parentKey attribute. Sometimes a pair of parentKey and generatedKey does not ensure unique identification of records (the parent-child relation) - this is the case when one parent has multiple children of the same element name. In such a case, these children may be given numbers as identification. By default, (if not defined otherwise by a created sequence), children are numbered by integer numbers starting from 1 with step 1. This attribute is the name of metadata field of the specified level in which the distinguishing numbers are written. It can serve as parentKey for the next nested level. If this sequence is defined, it can be used to give numbers to these child elements even with different starting value and different step. It can also preserve values between subsequent runs of the graph. Sometimes there may be a parent which has multiple children of the same element name. In such a case, these children cannot be identified using the parent information copied from parentKey to generatedKey. Such information is not sufficient. For this reason, a sequence may be defined to give distinguishing numbers to the multiple child elements. If the names of XML nodes or attributes should be changed, it has to be done using a pair of xmlFields and cloverFields attributes. A sequence of element or attribute names on the specified level can be separated by a semicolon, colon or pipe. The same number of these names has to be given in the cloverFields attribute. Do not forget the values have to correspond to the specified data type. What is more, you can reach further than the current level of XML elements and their attributes. Use the "../" string to reference "the parent of this element". For more information, see Source Tab. By default, XML names (element names and attribute names) are mapped to metadata fields by their name. If the names of XML nodes or attributes should be changed, it must be done using a pair of xmlFields and cloverFields attributes. The sequence of metadata field names on the specified level are separated by a semicolon, colon or pipe. The number of these names must be the same in the xmlFields attribute. Also the values must correspond to the specified data type. Number of elements which must be skipped. By default, nothing is skipped. Remember that nested (child) elements are also skipped when their parent is skipped. Number of elements which should be read. By default, all are read. XMLExtract Mapping Editor lets you define mapping by drag and drop. To be able to specify a mapping, you need XSD schema. The path to schema is set in the XML Schema attribute. If you do not have the schema, the component can generate it from the source file. If you have neither the schema nor a source file, you can still specify the mapping using source tab. 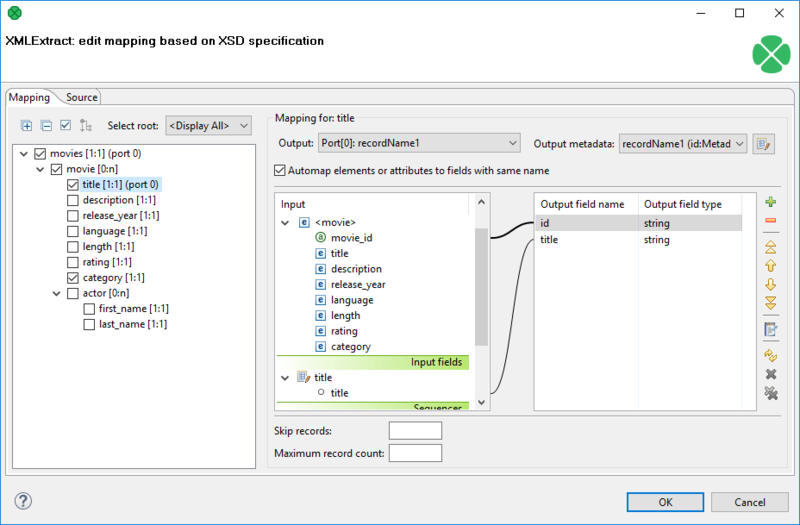 When using an XSD, the mapping can be performed visually in the Mapping dialog. The dialog consists of two tabs: the Mapping tab and the Source tab. The Mapping attribute can be defined in the Source tab, while in the Mapping tab you can work with your XML Schema. 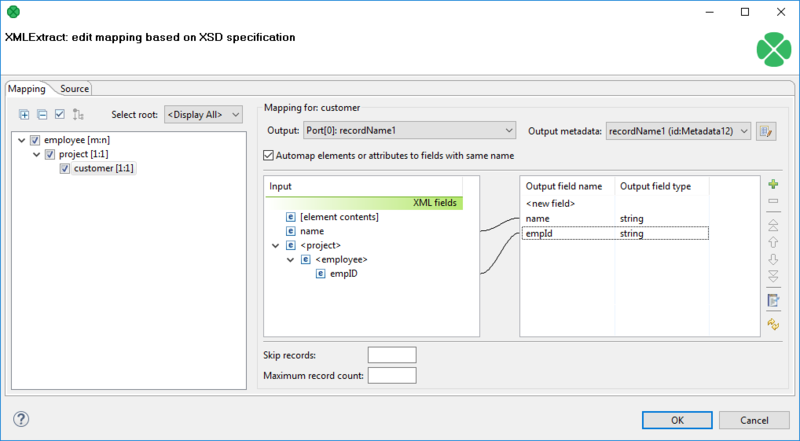 If you do not possess a valid XSD schema for your source XML, you can switch to the Mapping tab and click Generate XML Schema which attempts to "guess" the XSD structure from the XML. In the pane on the left hand side of the Mapping tab, you can see a tree structure of the XML. Every element shows how many occurrences it has in the source file (e.g. [0:n]). In this pane, you need to check the elements that should be mapped to the output ports. Not mapped - the mapping will not produce a record. By using such mapping elements, you can enforce that any child mapping will be processed only if the parser encounters this element first. Parent record - the mapping will not produce a record, but it will fill the mapped values to a parent record. portNumber(metadata) - the mapping will generate a record and write it to a selected output port. You can then choose from the list of metadata labeled portNumber(metadata), e.g. "3(customer)". On the right hand side, you can see mapping Input and Output fields. You either map them to each other according to their names (by checking the Map XML by name checkbox) or you map them yourself - explicitly. Please note that in Input - XML fields, not only elements but also their parent elements are visible (as long as parents have some fields) and can be mapped. In the picture above, the "pref:records" element is selected but we are allowed to leap over its parent element "pref:result" whose field "size" is actually mapped. Consequently, it enables you to create the whole mapping in a much easier way than if you used the Parent key and Generated key properties. You can also map the input fields (Input fields section), fields from record produced by the parent mapping (Parent fields section) or generate a unique ID for record by mapping a sequence from Sequences section to one of the output fields. sequenceId and sequenceField is set if some sequence is mapped to output metadata field. However it is possible to set just sequenceField. In this case, a new sequence is created and mapped to the metadata field. The mapping is valid but Mapping Dialog shows warning that metadata field is mapped to non existing sequence. Once you define all elements, specify output ports, mapping and other properties, you can switch to the Source tab. The mapping code is displayed there. Its structure is the same as described in the preceding sections. If you do not possess a valid XSD schema for your source XML, you will not be	able to map elements visually and you have to do it in the Source tab. It is possible to map an attribute or element missing at the schema. No validation warning is raised and mapping is visualized at the Mapping tab. Italic font is used when displaying mapped elements and attributes missing at the schema. If you want to map an element to XML fields of its parents, use the "../" string (like in the file system) before the field name. Every "../" stands for "this element's parent", so "../../" would mean the element's parent's parent and so on. Examine the example below. The "../../empID" is a field of "employee" as made available to the currently selected element "customer". There is one thing that one should keep in mind when referencing parent elements, particularly if you rely on the Use nested nodes property set to true: To reference one parent level using "../" actually means to reference that ancestor element (over more parents) in the XML which is defined in the direct parent <Mapping> of <Mapping> with the "../" parent reference. Let us recall the mapping from last example. We will omit one of its <Mapping> elements and notice how also the parent field reference had to be changed accordingly. The dot can be used in the xmlFields attribute just like any other XML element/attribute name. In the visual mapping editor, the dot is represented in the XML Fields tree as the element's contents. The following chunk of code maps the value of the customer element on metadata field customerValue. Next, project (i.e. customer's parent element, that is why ../.) is mapped on the projectValue field. The element value consists of the text enclosed between the element's start and end tag only if it has no child elements. If the element has child element(s), then the element's value consists of the text between the element's start tag and the start tag of its first child element. Remember that element values are mapped to Clover fields by their names. Thus, the <customer> element mentioned above would be mapped to Clover field named customer automatically (implicit mapping). Remember the explicit mapping (renaming fields) shown in the examples has a higher priority than the implicit mapping. The implicit mapping can be turned off by setting implicit attribute of the corresponding Mapping element to false. It is possible to map a content of an element to a field. In such a case, the whole subtree of an element is sent to an output port. To map element content, use '+' or '-' character. The difference between '+' (plus) and '-' (minus) mapping is, that '+' maps element's content and its enclosing element and '-' maps element's content, but not element itself. The mapping of an element content can produce very large amount of data. It can have high impact on processing speed. The following chunk of code maps the value of element project on metadata field projectValue and value of the customer element on metadata field customerValue. The customerValue field is set in the same record as the projectValue. The Source tab is the only place where templates can be used. Templates are useful when reading a lot of nested elements or recursive data in general. Furthermore, a template reference can appear inside a template declaration. The reference should be placed as the last element of the declaration. If you reference the same template that is being declared, you will create a recursive template. and you can use both ways of nesting references. The latter one, with three nested references, can produce unexpected results when inside a template declaration, though. In each sub-level, templateRef copies its template code. BUT when e.g. the 3rd reference is active, it has to copy the code of the two references above it first, then it copies its own code. That way, the depth in the tree increases very quickly (exponentially). However, to avoid confusion, you can always wrap the declaration with an element and use nested references outside the declaration. See the example below, where the "wrap" element is effectively used to separate the template from references. In that case, 3 references do refer to 3 levels of nested data. In summary, working with nestedDepth instead of nested template references always grants transparent results. Its use is recommended. 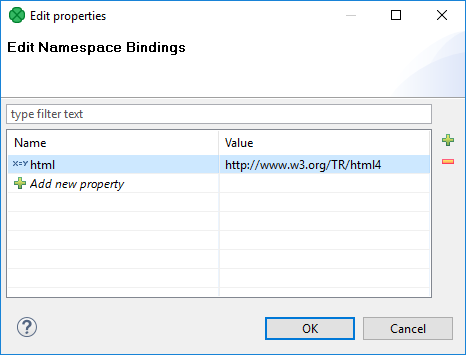 After you open Mapping, namespace prefixes will appear before element and attribute names. If Name was left blank, you would see the namespace URI instead. Sometimes the schema defines an element to be of some generic type, even though the actual specific type of the element will be in the processed XML. If the subtypes of the generic type are also defined in the schema, you may use the Select subtype action. This will open a dialog as shown below. When you choose a subtype, the element in the schema tree will be treated as if it was of the selected type. This way, you will be able to define the mapping of this element by using the Mapping editor. The information will also be stored in the Mapping source - see Type Override Tags. In this case, the element customer has the name attribute and child element of the same name. If both the attribute name and the element name are to be mapped to output metadata, the following mapping is incorrect. Result of this mapping is that both field1 and field2 contains the value of the element name. Following mapping should be used if we need to read the value of the name attribute to some output metadata field. 4.1.0 XMLExtract now reads lists.